Before moving to California a little husband and wife run vintage-inspired jewelry company, Match Accessories, popped up on my radar via Instagram. Their most popular item was a brooch inspired by the classic Disneyland D, with its swooping and pointed serifs. 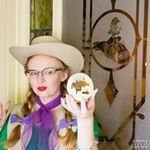 After moving to California I had the pleasure of meeting them at the Dapper Day Expo, seeing their products first hand and I instantly fell in love. After achieving much success within the Disney and vintage community with their now iconic D brooches copycats started to crop up. I got my hands on some of these copycat items to see if they were any good. Match Accessories offers their “Gothic D” brooch in both cast dyed resin and laser cut wood, but this post will focus on the resin brooches. The D brooches come in a variety of colors (including pearl/iridescent colors, as seen in the middle brooch here) and some feature glitter. The glitter is part of the resin and sits within it, creating a smooth surface. The rhinestone one on the far right was done as a collaboration with The Vintage Darling, and uses true vintage Czech glass crystals, each of which are sunk into the D.
A standard D brooch, of solid color, glitter, or pearl, currently costs $27. The Vintage Darling collaboration D costs $40. When Match was just starting out, they glued on the closures, but beginning in 2016 Match began to rivet on the closures and made the brooches themselves thicker, making them even more sturdy than before. Additionally, Match uses the locking style pin-back. Each Match D brooch measures 2 1/4 inches by 2 1/2 inches, and a quarter of an inch thick, not including the backing. They are rigid and solid feeling while also lightweight. Match also hand finishes each of their items, both sanding and polishing. Each of these D brooches came from a different seller, and ranged from $5 to $20. The biggest difference is the size variety. Each of these vary in size wildly, and none are the same size as Match. The far left, bright purple brooch is 1 3/4 inches by 1 1/4 inches, and 3/8 of an inch in thickness. At first glance it’s not too bad, however it is on the chunkier side in terms of the overall silhouette of the letter. It is made up of a lightweight plastic that is so flexible I can easily manipulate it with my hands. The back is raised along the edges, informing me it was not sanded in any way to make it even after the molding process. Like Match, the glitter appears to be part of the plastic, and the top is smooth against my finger. The middle, dark purple brooch is 2 13/16 inches by 2 1/8 inches, and extremely thin, at only 1/8 of an inch in thickness. It also appears to be 3D printed judging by the lines throughout the brooch. And unlike a Match D or the previously mentioned one, the glitter here is applied after the brooch is made, and is raised against my finger. The far right, black brooch is 1 1/2 inches by 1 1/8 inches, and even thinner than the previous at 3/32 of an inch in thickness. This D brooch is made of cut acrylic, and the rhinestones are simply glued on top. I think the biggest disappointment with this one is that the maker did not take the size into consideration, and glued an inappropriately sized closure onto the back, which juts out, and is quite distracting, and, in my opinion, completely unacceptable for a product that is made to be sold to the public. Additionally, each copycat D features a glued on closure, only two of which are locking. Overall, this was a really interesting learning experience that confirmed a suspicion, Match Accessories is still the best in the business when it comes to the Disneyland inspired D brooch. I was not approached by Match Accessories to write this post. I wrote this post of my own accord. Match is the best of the best! Their brooches don’t catch on my clothing and are finished beautifully.